Walt Disney World really makes dining with food allergies easy. I chatted a while back about my favorite resources for doing your Gluten Free Disney research but since then it has gotten so much easier. Every single Disney owned restaurant has a food allergy plan, and menu. They have even made it easier and faster by at a lot of locations you don't even need to speak with the chef to place your order. In fact, you can view the Gluten Free menu for Disney's California Grill right from the My Disney Experience App. This dining experience took place on October 24th, 2015. 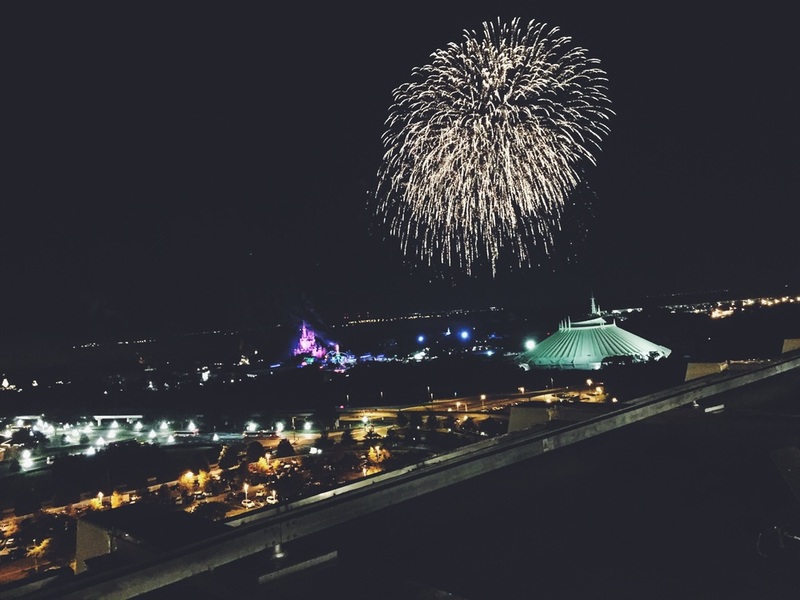 We choose California Grill for their amazing food and views of our favorite Magic Kingdom Fireworks display, Wishes. 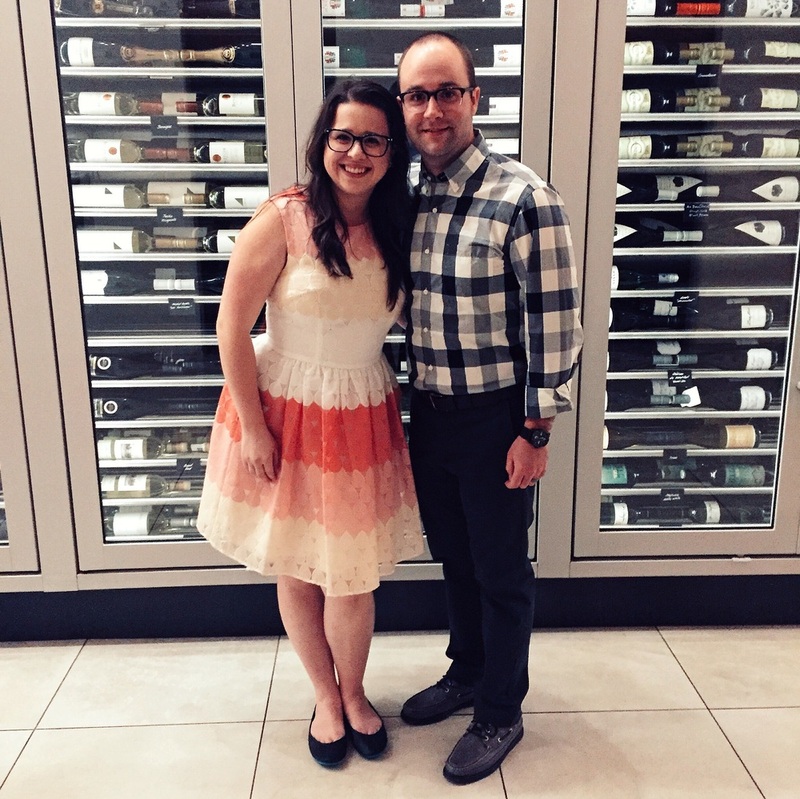 We thought it would be the perfect place to get all dressed up and celebrate our 5th wedding anniversary. California Grill does have a slight dress code, but nothing too strict. You could tell there were a few people who came straight from the park. Since this was a special occasion we decided to dress up but we were hardly the fanciest there. When we arrived to the Contemporary Resort. We followed the signs for the California Grill check in. You check in on a different floor than the restaurant is located on. Once we were checked in and given a pager, a hostess ushered us into a private elevator and up to the restaurant. We arrived about 20 min ahead of our reservation which gave us plenty of time to enjoy the bar area while they got our table ready. I had the most amazing drink, which was called Santa Monica Cider. It contained Rekorderlig Strawberry Cider, Hendrick's Gin with Agave Nectar, Lime Juice and Micro Basil. Hands down it was the best drink I have ever had. I checked the Rekorderlig website to verify that the cider was gluten - free, it was! I highly suggest this if you like gin. Don't worry I kept the adorable drink stir. We decided to skip the appetizers so we had room for dessert. Honestly the gluten - free appetizers didn't really appeal to us. They brought us out gluten - free rolls to start our meal, and some amazing butter with fresh sea salt. I ate a second roll just for more of that butter. The server was very helpful, and went over the gluten free options on a special allergy menu that was brought when we sat down. (I had noted it in our reservation) We chose not to speak with the chef, although that is always an option for guests with extra concerns about allergies. We placed our orders right around 9:45 and it was time to go wait for Wishes to start! Some tips on viewing Wishes from the California Grill observation area: We made a 9:30 dining reservation and arrived early. This worked out perfect because we were able to get a drink, place our order and have a roll (or two) before it was time for heading out. The table next to us had their food arrive as the fireworks were starting and they were faced with the horrible decision of having to eat hot food or enjoy the fireworks. I would suggest heading out to the right side, if you are looking at the Magic Kingdom, viewing area by 9:45 for a good spot. By 9:55 (Wishes was at 10pm that night) the viewing area was packed. If you dine earlier in the night, just keep your receipt, they will let you back in when it's fireworks time! hereWatching Wishes from the Contemporary viewing area was a real treat! The lights are dimmed inside, and the music is pumped in both inside and out. You don't realize how huge the display is until you are viewing it from far away. When Wishes was over we headed back in and it wasn't much longer until our entrees arrived. Cameron ordered the Bison Strip Lion. He loved it. 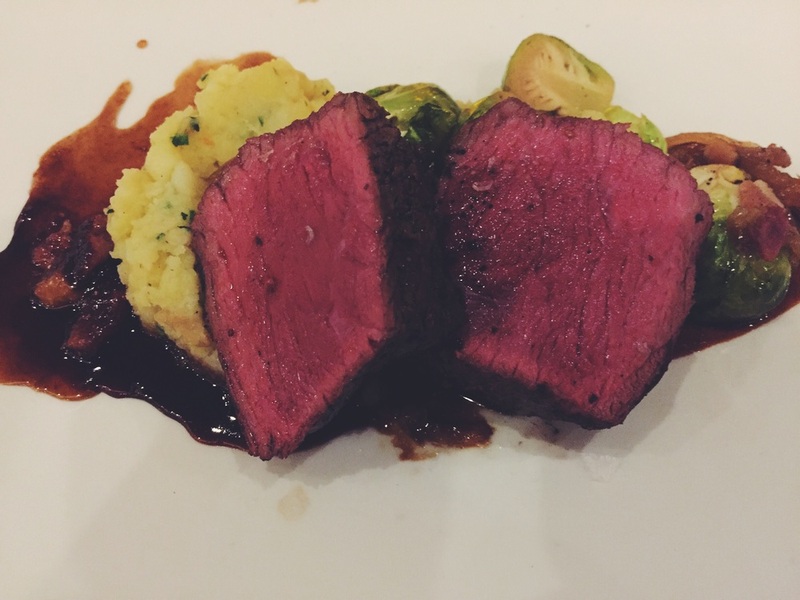 The bison was cooked perfectly and everything else on the plate from the brussel sprouts to the glaze was perfect. I ordered the signature dish, Pork Two Ways. Although the Bison was amazing, this was probably the best thing I have ever eaten. On the left of the dish was pork loin over a goat cheese polenta with mushrooms and a delicious sauce. It was so good, I could have eaten a bowl of that goat cheese polenta. On the right is the real star of the dish though. Crispy pork belly on top of a fried apple with an applesauce on the side. There are no words for the amazingness that is this pork belly. After we successfully polished off our entrees it was time for dessert. We ordered the chocolate pudding cake. Which is Chocolate Cake with Nutella Filling, Meringue Kisses, and Chantilly Cream. OMG. I think the homemade marshmallows and the meringue kisses were the best part, but we loved everything about this dessert. And since the waiter knew it was our anniversary it came with a little edible chocolate congratulations message. Since our reservation was at 9:30 and the restaurant closes at 10 there was hardly anyone left when we were leaving. We went out on the observation deck to get one last look at Magic Kingdom before we headed home. It was an amazing night and a dining experience we won't forget. When we were leaving Cameron said this should be our special night out once a year and I won't fight him on that. 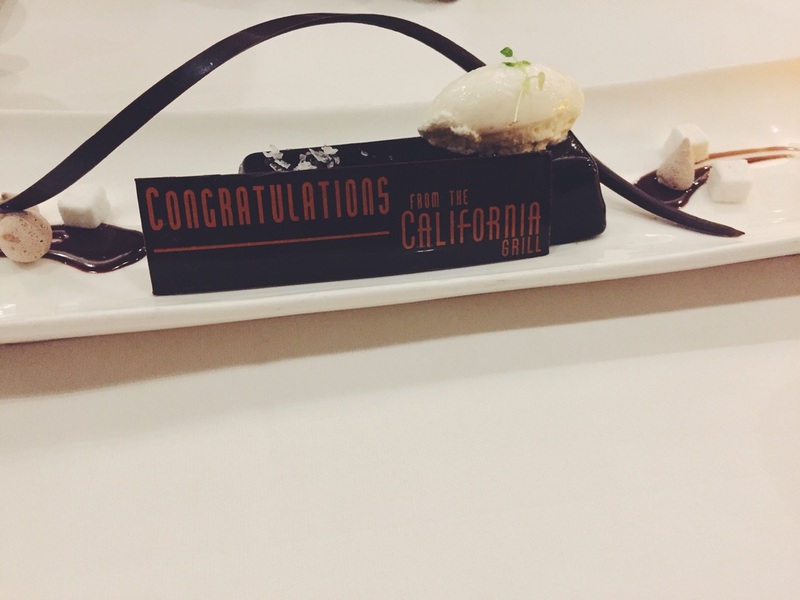 Have you eaten at California Grill? What was your favorite?